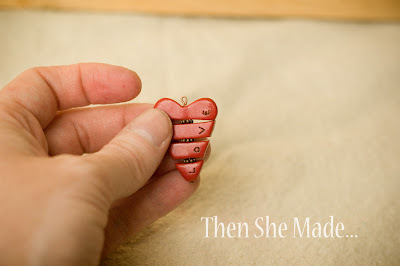 Last year I posted a really quick valentine necklace idea . The necklace last year was super quick to make as it was assembled from stickers and easy for kids to make. Do you remember it? 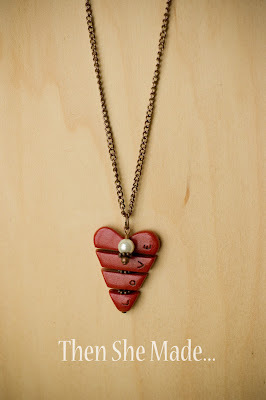 You can see it here if you don't: Heart Sticker Necklace. 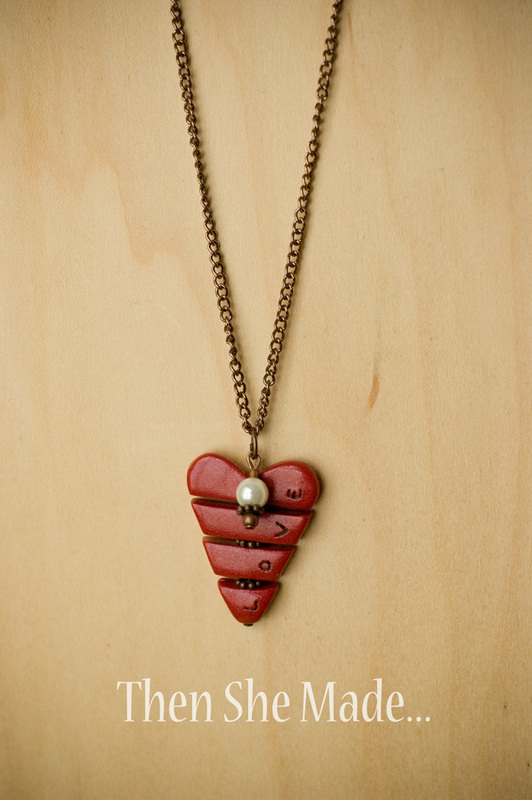 This year, keeping with the tradition of a Valentine necklace, I thought I'd step it up a bit. Here's what I came up with and really, it's pretty easy too. Want to make it? If you do, here's what you will need and all the steps to do it. 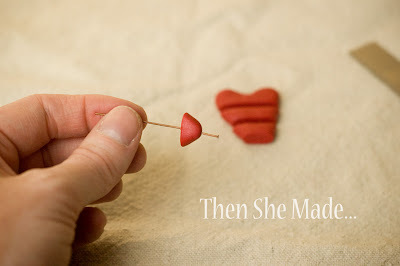 Clay: I used Sculpey Red but other brands and colors will work just fine too. 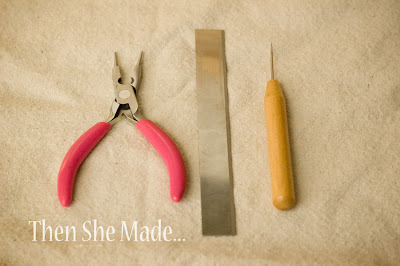 Tools: Needle nose pliers, a cutting tool (mine's a razor), and, an optional item is a sharp pokey thing like a paper piercer. Also, not shown, but you may need wire cutters too. 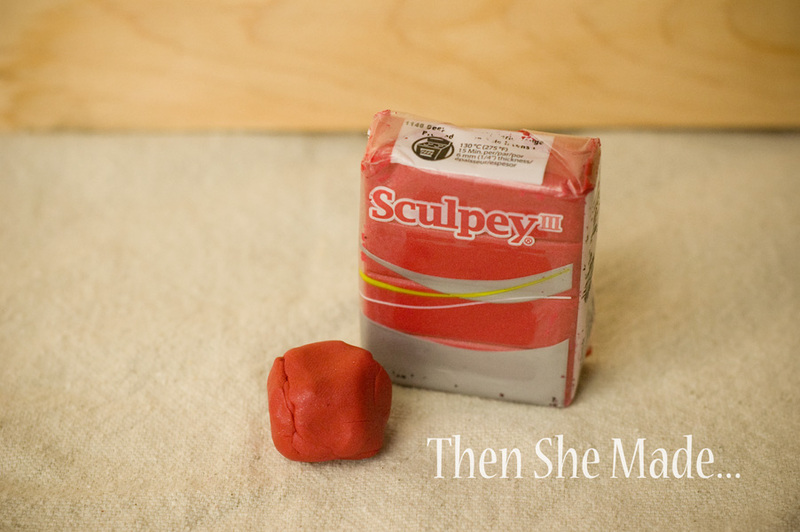 Step 1: Take a small amount of your clay and condition it. Conditioning just means you roll it, smoosh it, and knead it for a few minutes to get it good and soft. 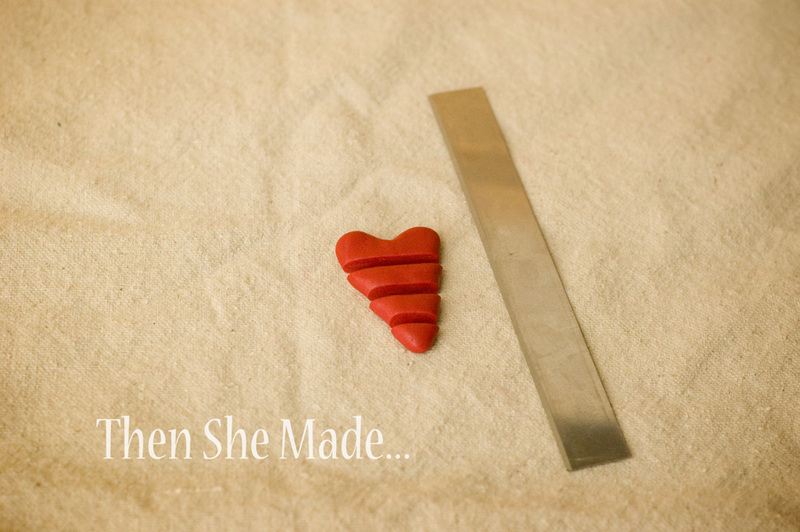 After the clay is workable, shape it into a heart. I free handed mine but you could use a heart shaped clay cutter if you have one. Tip: Try to make sure that your design has the same thickness all over. You don't want one side thicker than the other or it once it is finished it will hang funny from the chain. Step 2: Next, using your cutting tool, cut your heart up into horizontal slices. You can cut it into several different pieces but I found that four was a good number for mine. Step 3: Then, after your heart is sliced, take your bottom clay piece and carefully push it onto the head pin. Make sure to scoot it to the bottom of the pin but do not push the clay over the end part. 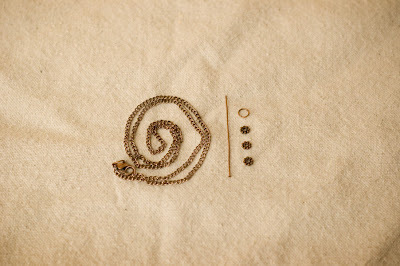 Step 4: Continue the process of adding your clay pieces to your head pin and be sure to add a spacer in between each layer. 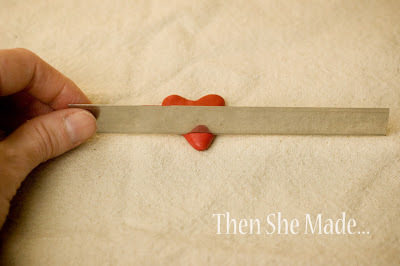 Step 5: (not shown & optional) If you want to, you can add a design or word to your heart. I wrote the word "love" on mine. To do this, use your pokey tool and carefully spell out the letters. Step 6: Bake your heart - head pin, spacers and all - in a pre-heated 275 degree oven for 15-18 minutes. Be careful not to over cook as the clay will start to brown. Step 8: (not shown) Attach your jump ring to the loop on your head pin and then put it on your necklace chain. And you are DONE! See, not too hard, right?! Also, just a FYI - I didn't list this in the steps because you can do without it BUT if you want to add a finish to your design, you know to give it a little shine, you can do so. 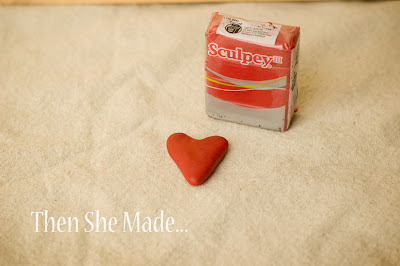 You can use Mod Podge dimensional glaze, some types of plain mod podge or you can even buy clay finishes made by Sculpey. Again, you don't need it but can add it if you want. I have been looking at salt dough recipe to do a few crafts with the kids at home and... I was wondering if it would work to make the beautiful nativity scene you made last year. 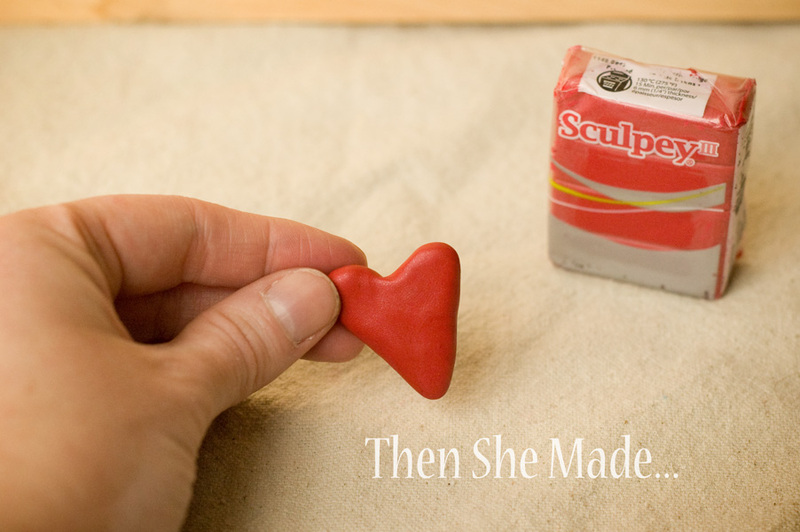 I was hoping to be able to buy the sculpey clay but I am short on dough. :) so I thought I would just make some. Have you had any experience with salt dough? Do you think I could use your instructions but use salt dough instead? I thought your instructions for using foil inside the clay really great to avoid burning and cooking the pieces quicker. What do you think? Very Sweet little piece!!!! thanks for sharing the tutorial! OMG! This is so cute! I've been tinkering around with clay but it all looked a bit stodgy. This is perfect! AND I have everything! 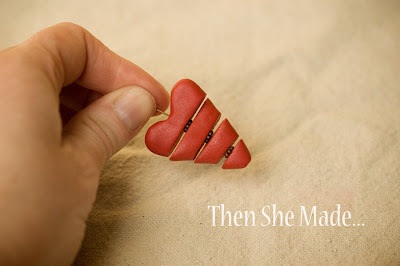 This is a sweet and simple project with great results! Thank you for sharing this tutorial!